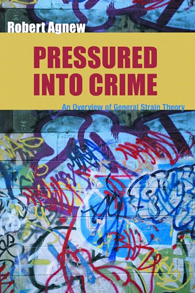 Agnew's 2007 book on the General Strain Theory is called "Pressured into Crime." Emory sociologist Robert Agnew grew up in Atlantic City, New Jersey, during the 1950s and 1960s. It was the pre-casino era, and Atlantic City was a rundown, dying resort. Neither of Agnew's parents finished high school and the family lived in the poorest section of town, known as the Inlet. "It was the type of place where it's easy to get interested in sociology," Agnew says. He attended Atlantic City High School, during an era of tense divisions of race and class. "There were regular fights," Agnew says. He recalls an especially harrowing incident during a study hall, when he was sitting in the lower part of the auditorium. Students in the balcony began unscrewing large floodlights from the ceiling and throwing them down at the students in the lower seats. "The atmosphere wasn't conducive to learning, but at the same time I was exposed to a lot of things that most people aren't, and I benefited from that," he says. "It became clear to me that social location has a large effect on one's behavior and views." Agnew went on to develop one of the leading theories on the causes of crime and delinquency: General strain theory (GST). Classic strain theory had focused on the inability to achieve middle class success. For his 1980 dissertation, Agnew expanded this line of thought into GST, which focuses on a range of additional strains or stressors. Those most strongly related to crime are high in magnitude, perceived as unjust, associated with low social control, and create some pressure or incentive for criminal coping. Examples include parental rejection, bullying, chronic unemployment, discrimination and criminal victimization. Over the years, GST has been further developed and tested, and is regularly cited in criminology textbooks. The entire May 2010 issue of the Journal of Contemporary Criminal Justice is devoted to the topic. "It's gratifying that researchers keep applying general strain theory to new issues," Agnew says. He served as co-editor of the special issue, along with Paul Mazerolle of Griffith University in Australia. "We solicited a wide range of articles that didn't simply test the theory, but took it into new directions." One of the articles compared the effects of traditional bullying with cyber bullying -- the harassment of a child through a computer or cell phone. "I was surprised that the authors found that cyber bullying has a stronger association to crime than the traditional, face-to-face variety of bullying," Agnew says. He's currently working on a chapter for a forthcoming book, "The Origins of American Criminology," summarizing GST and how it has developed and expanded over time. "I'm sure that additional revisions and extensions of the theory will continue to emerge," Agnew says. "Crime theories are ongoing creations, reflecting the particular experiences, as well as the strengths and weaknesses, of their creators." In the coming year, Agnew plans to focus on climate change - including its potential impacts on crime. "Climate change is probably going to become THE major issue for everyone," he says. "Very little research has been done on the possible social consequences of climate change, so I'd like to try to make a contribution."